On the politics beat in Wednesday's Washington Post: first, don't ever let them tell you that liberal reporters don't want to be stenographers to power. They don't mind writing news stories that read like a press release...if they're about Hillary Clinton. FNC's Fox And Friends Use the Dreaded Word: "Illegal"
WashPost Essayist Gets Wiggy With Illegal-Alien Rally: A Crowd of Vegetables? I'm truly amazed at the oozy, woozy promotional coverage the pro-amnesty rally received in The Washington Post today. (For a nice dose of balance, for a more skeptical take on the rally, see Michelle Malkin's photo/video roundup.) But the really woozy take on the power of the rally crowds emerged in the Style section today from classical-music critic/fanciful political essayist Philip Kennicott. On CBS, Harry Smith Oozes Over Aliens Draped In "The American Dream"
Yesterday, many people from around the country gathered in cities and demanded rights for illegal immigrants, and these protests were the primary focus of this morning’s "The Early Show" on CBS. 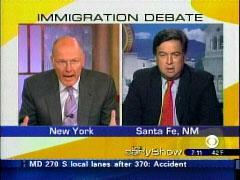 In one segment, co-host Harry Smith interviewed Lou Dobbs, host of CNN’s "Lou Dobbs Tonight" and Bill Richardson, governor of New Mexico. Through his questions, Smith made it pretty clear where he stood on the immigration issue. CNN's Schneider: Immigration Rallies a "Spontaneous" Sign of a "New Consciousness"
Starters: Yesterday's illegal immigration rallies attracted a lot of media and blogger attention. Of course, since most of the media favors unchecked immigration of any kind, they have a tendency to cover up the more outrageous signs that protesters were sporting Monday. If you're looking for blog coverage of the protests, head over to Instapundit.com. 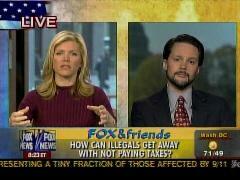 Which party will benefit from illegal immigration as it gains a higher profile in the national debate? The Washington Times thinks Democrats stand the most to gain. Ace of Spades agrees, arguing that the Dems' strategy of not offering policy alternatives pays off on at least this issue. Media: Bob Schieffer and CBS News accused of racism by fired producer. "Schieffer has a reputation for bigotry," Raylena Fields alleges. He "frequently and publicly refers to a newsroom assistant as 'Brownie' due to the complexion of his skin." Fields also claims she saw the anchor address a black correspondent as "boy." In middle eastern media, Saudi television regularly allows anti-semitic and anti-American rhetoric on its government-owned airwaves. MEMRI exposes one of the more virulent ranters who compares American "neocons" (aka Jews) of being the "closest thing there is to Nazism." (ht LGF). How did the media cover guns last week? Alphecca blog's Jeff Soyer answers that in his weekly roundup of press gun coverage. The three broadcast networks led Monday night with multiple stories which celebrated the protest marches held by illegal immigrants and their supporters, with all three featuring sympathetic anecdotes about the plight of those here illegally. “Tonight,” ABC anchor Elizabeth Vargas touted in forwarding the red herring that conservatives are against “immigration” as opposed to illegal entry, “hundreds of thousands of people marching in streets across America, trying to convince the country that it needs immigrants." World News Tonight went to three field reports, starting with Miguel Marquez in Phoenix: “Everywhere you look, there are American flags. They're marching under the banner of 'Somos America,' 'we are American.'" But Dan Harris in New York City saw that “like many people here,” one man he spoke with “is carrying a Mexican flag. He says 'I don't need to carry an American flag for people to know that I want to be an American.'" In anticipation of mass rallies in support of illegal immigrants, pro-immigrant reporter Nina Bernstein made Sunday’s front page with “Making It Ashore, but Still Chasing U.S. Dream,” following up on the stories of the 286 Chinese immigrants on Golden Venture freighter that ran aground off Queens in 1993. During his final commentary segment, in which Geraldo Rivera praised the role of the Catholic Church in the immigration debate, the sometime boxer took a swing at CNN's Lou Dobbs. "Now as Congress approaches a compromise that rejects the severe and mean-spirited sanctions advocated by people like the shrill CNN commentator Lou Dobbs, instead choosing a path to legalization for the 11 million the role of the Catholic Church has played will go far to restore its own tattered image..."